Don't waste time waiting for your kettle to boil. The Andrew James Lumiglo Kettle has an outstanding 3000 watts of energy allowing it to boil from one cup to its 1.7 litre full capacity in a fraction of the time compared to a standard kettle. There are clear level markers on the outside of the jug so you can easily see how much water you have in the kettle. Packed With Safety Features: This kettle features a swivel base and non-slip feet to keep your kettle secure on the worktop whilst it is being used. There's also an auto-cancel boil-dry protection function that prevents the kettle from boiling when there isn't enough water in the jug. 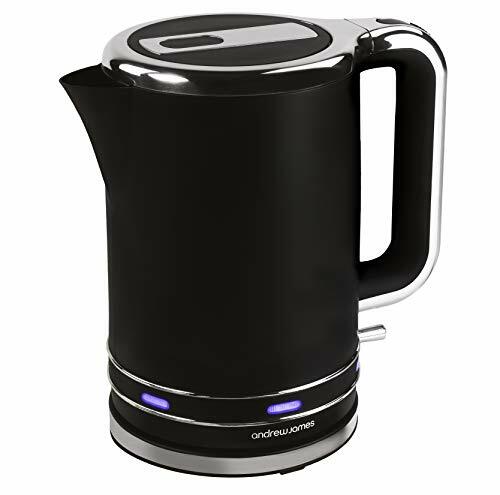 This stylish kettle is part of the Lumiglo Range and, like the other appliances in this set, it has a matt black finish with silver coloured chrome elements and bright blue LED lights that illuminate during operation. Together the kettle and toaster make a fantastic addition to any home or office kitchen. For the ultimate breakfast you can also purchase the Lumiglo Filter Coffee Maker. ILLUMINATING FAST BOIL KETTLE -- The Andrew James Lumiglo Kettle looks great and saves you time in the kitchen. With 3000W of energy it can rapid boil its large 1.7 litre capacity, illuminating with blue LEDs whilst it is heating your water. CORDLESS JUG KETTLE WITH REUSABLE FILTER -- This electric jug kettle has the power cord in the base for easy lifting. The lid flips open through 90 degrees for filling. Plus, the plastic filter is simple to remove, clean and replace. PACKED WITH SAFETY FEATURES -- Your Lumiglo kettle features a swivel base and non-slip feet. There's also an auto-cancel boil-dry protection function that prevents the kettle from boiling when there's insufficient water in the jug. PART OF THE STYLISH LUMIGLO RANGE -- With a matt black finish, gleaming chrome elements and blue lights, this kettle would look fabulous in any modern kitchen. The Lumiglo Range also includes a matching toaster plus a stylish filter coffee machine. 2-YEAR MANUFACTURER'S WARRANTY -- Shop with confidence. Your Andrew James Lumiglo Kettle is covered by a 2 year manufacturer's warranty.